This easy 4-ingredient Butterfinger Fudge tastes just like the candy bar and it’s made with candy corn! 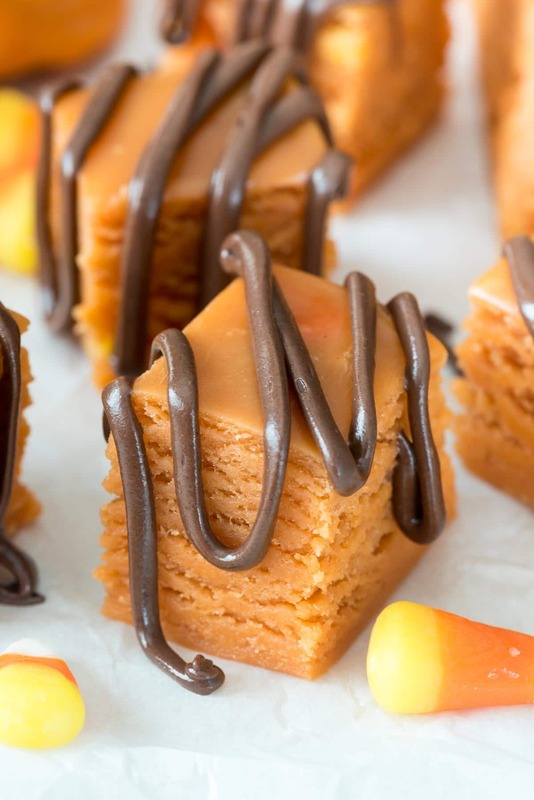 If you have leftover candy corn…or just love Butterfingers, make your own in fudge form with this easy recipe! It’s like magic! I think Halloween was one of my favorite holidays as a kid. I mean, it’s the candy holiday. How could I not love it? I know I loved me some Reese’s. And M&Ms. And Twix (the peanut butter ones, remember them? I never see them anymore). But Butterfinger? I’m not sure I remember being SO in love with them. I mean, I know my mom loved them. She always had them hidden in her stash. Have I not told you about my moms’ candy stash yet? Oh, goodie. Buckle up, kids. You see, my dad (and, it turns out, me) have this problem with portion control. As in – we have none. So, two candy bars could disappear in about three seconds. Candy isn’t cheap and my mom was tired of it disappearing quick as pinot grigio at a RHONY event. So, she hid her candy from the two of us. Occasionally she would let me in on the secret. Or, I, um, would find it on my own. No, you should not leave me alone in your bathroom. I will look in the medicine chest. Anyway, I learned from a pro and I have perfected the hidden candy stash. I hide it in plain sight…where Jordan wouldn’t even think to look. Kinda genius, if you ask me. Okay, back to the matter at hand. Butterfingers. I remember eating them as a kid. I mean, I ate them the normal way and everything: I sucked off all the chocolate and then ate the center. What? That’s totally normal, right? RIGHT?? 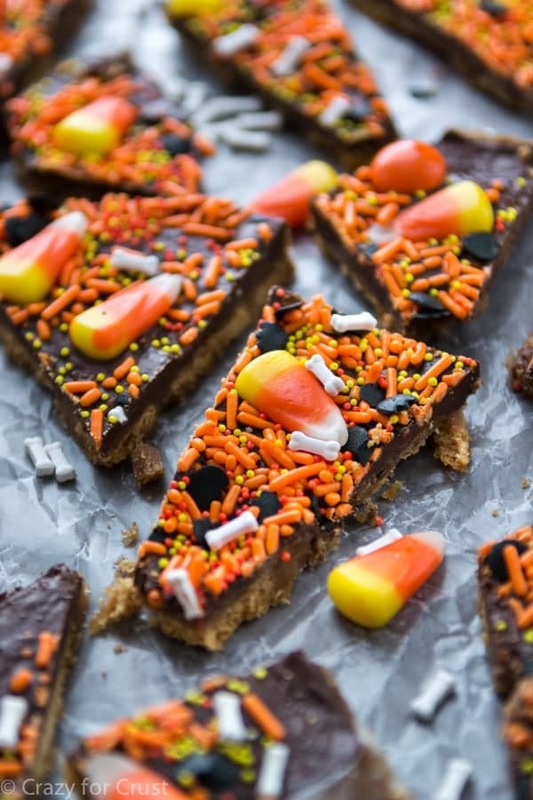 When Hayley posted her Homemade Butterfingers a few weeks ago, I remember that I totally wanted to make them because I had a huge bag of candy corn in my pantry. Oh yeah, you know about this recipe, right? How candy corn and peanut butter get married and produce Butterfinger children? It’s so strange it’s weird at first…like your brain doesn’t want to accept the fact that it’s true. So, anyway. I decided to make the homemade Butterfingers. But, well, I cannot follow a recipe. So I used Hayley’s recipe…and made it into fudge. 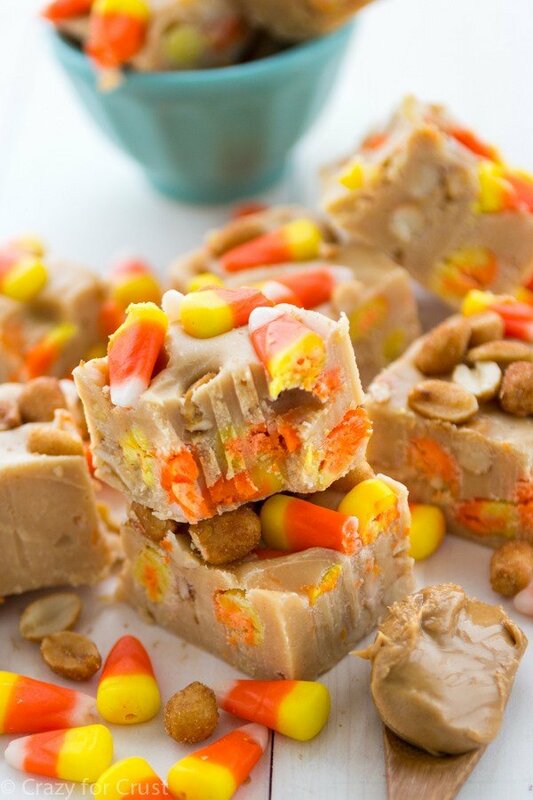 This easy Butterfinger Fudge is made with candy corn and has just 4 ingredients! 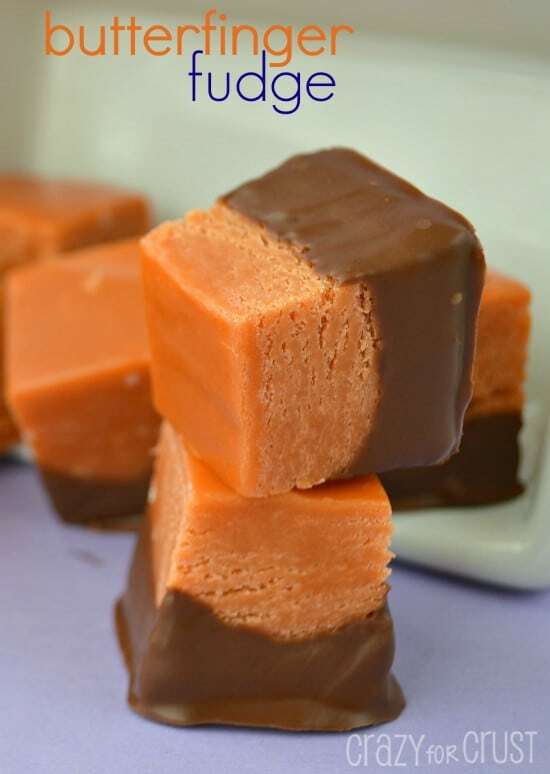 This fudge tastes like Butterfingers. It’s soft and chewy, a little chewier than traditional fudge. I like it plain…but for the purists out there, I drizzled some with chocolate. Those were good too. Butterfinger fudge is fudge made with candy corn and peanut butter! If I wasn’t on this cleanse I’d have to hide them from myself. And that never really works, does it? Be sure to use fresh candy corn. You don’t want to use the stale stuff from last year. Candy corn takes a long time to melt down, which is why I recommend using a saucepan. It works, just keep melting and stirring. You can add chopped candy bars to this or dip the fudge in chocolate. I like it plain or drizzled with chocolate! This easy 3-ingredient Butterfinger Fudge tastes just like the candy bar and it's made with candy corn! Line a 9x9-inch pan with foil and spray with cooking spray. Spread evenly in pan. Cool on counter about 15 minutes, then chill until hardened. Cut into squares. If you want, you can dip the fudge in milk chocolate or drizzle chocolate over the top. Melt chocolate chips (I added a little vegetable oil to thin them) and dip the bottoms of the fudge squares in the chocolate. Set on a wax paper lined cookie sheet to harden. Be sure to use fresh candy corn! Don't use the stale stuff from last year or it may not melt correctly. I normally use Skippy Naturals. Any regular no-stir peanut butter will work. I made this fudge yesterday, And I must say it was killer good. I love it so much!! For added decoration I sprinkled some chopped peanuts on top of the chocolate. Yum! Best fudge ever!!! I tried this recipe and then talked to other people who have made it also. If you use the candy corn made with honey you will have a hard time getting it to melt. That is also why sometimes it gets really hard and does not stay soft. The only people to make candy corn with out honey is jelly bellies but than you are paying a lot for the candy corn. This is so yummy! I had them at a baby shower and decided to add them to my Christmas candy list. I went searching for candy corn and it was nowhere to be found. However I did find some Christmas mellocreme candies and decided to give it a try. The results were a darker fudge and maybe a slight difference in the taste but overall still yummy and butterfingery. Hopefully they last until Christmas! How many ounces is the sweetened condensed milk? I saw this recipe this morning and had to get out of bed and make it. My son and I LOVE it!!! Even my boyfriend who doesn’t care for peanut butter loved it! It definitely did take some time to melt. Some of my white chocolate didn’t quite melt but I left just a few small pieces whole and they taste just fine. Thanks for an awesome recipe! I just made this last night it it taste wonderful! Next time i make it i think i’ll pulse the candy corns in a food processor first so it doesn’t take so long for them to melt. Surprisingly this wasn’t over the top sweet like a lot of fudge is. Great recipe! + peanut butter + condensed milk + white chocolate chips = 3 ingredients? Interesting math, there. These white chips take forever to melt? Can I use the pumpkin candy corns?